People standing and sitting outside and two people standing on the roof of Wolfenden & Lawrie Marble Works. There is also a horse drawn cart in the foreground of the picture. 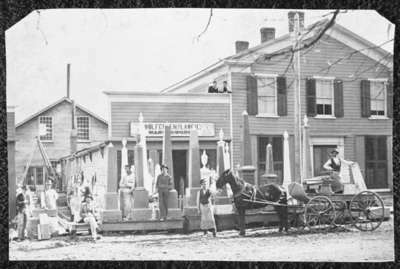 It is believed this shop was located at 105 Dundas Street East on the south side between Brock and Green Streets and that it was destroyed by fire October 16, 1877. However, it is unknown if this is the shop from Whitby. Johnathan Wolfenden started a marble works in Whitby as early as 1849. It is not known when he had his partnership with Mr. Lawrie. The business closed in the 1890s. Scanned from a 1978 copy of the original.